Cartref Farm is a magnificent 121-acre farm estate located in Newberry Township, York County, half-way between Harrisburg and York, Pennsylvania. 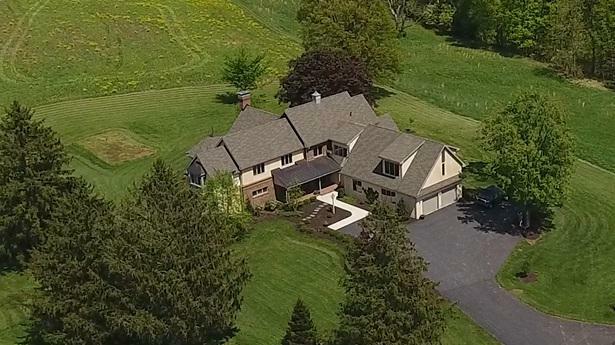 A paved drive enters the property to arrive at a comfortable and attractive 7,000 SF home. In perfect harmony with its surroundings, the main house overlooks a pond, in-ground swimming pool, historic bank barn, a stream, acres of pastures, and a 1,400 SF caretaker's house. FARMSTEAD STYLE WITH 21ST-CENTURY LUXURY - Built in 2012, the main residence has been designed to high standards. The interior is characterized by warm and inviting living spaces with classic architectural elements, such as 10-foot-high ceilings, interior brick, reclaimed oak hardwood flooring, and cherry kitchen cabinetry. 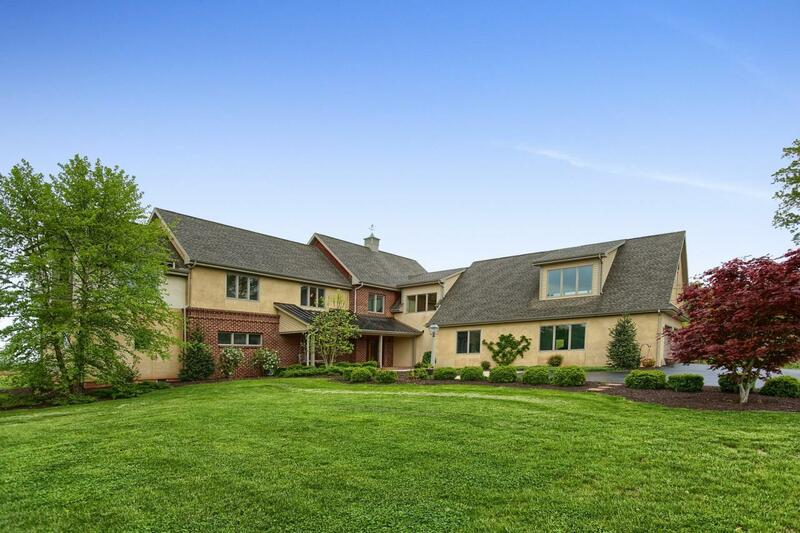 The residence offers ample opportunities for grand-scale entertaining indoors and out, on the screened-in porch or outdoor patio that overlooks 10 acres of woodland. LIVING AND ENTERTAINING SPACES: FARMHOUSE FEEL WITH ELEGANCE - Visitors are welcomed warmly into the home on the covered full brick front porch. Once inside, the brick interior walls bring a sturdy farmhouse feeling. The two-story great room is graced with a floor-to-ceiling native stone fireplace, soffit lighting, large windows overlooking the pastures and woods and expansive space. Adorned with oak hardwood flooring reclaimed from a barn in York County, the great room transitions seamlessly to the double island kitchen. The former is warmed by a wood fireplace, while the latter has large double granite islands and a walk-in pantry. Complementing the main level is a music room or study with an exquisite ceiling and custom cabinetry, a three season screened-in porch, and a luxurious master suite. RETREAT TO PRIVATE QUARTERS - The main level includes a laundry room, two powder rooms, and a mud-room with access to a covered porch and oversized three car garage. Upstairs, the spaciousness continues with four bedrooms, each with a full bath, a 5th bedroom/children's study/play room, laundry room, an unfinished bonus room and abundant storage. The lower level basement is unfinished but includes Bilco door access to the outside. GROUNDS FOR RELAXATION AND ENJOYMENT OF NATURE - A 1/4 mile driveway assures privacy and introduces this beautiful property. Set amid more than 121 acres of picturesque grounds, Cartref Farm is a recreational idyll. The spring-fed pond is stocked with fish. 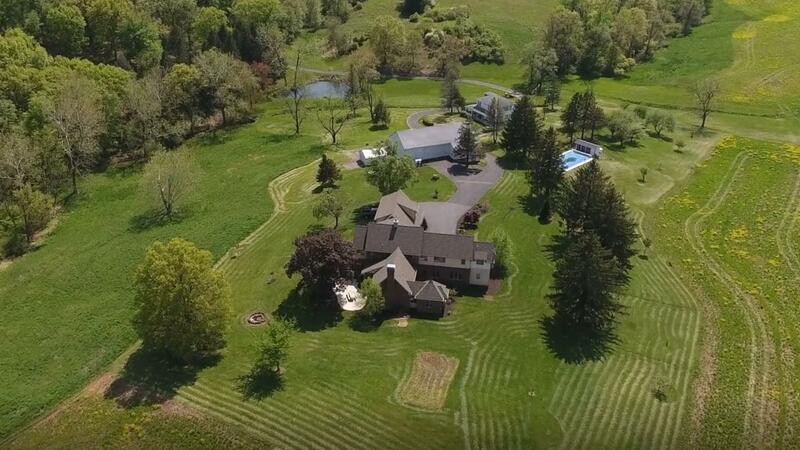 Two streams traverse the length and width of the property and approximately 10 acres of woods provide a beautiful natural setting. The 20x40 inground pool features an enclosed pump house and pool house with changing room. THE GENTLEMAN FARMER OR EQUESTRIANS DREAM - quality outstanding, Cartref Farms grounds are arrayed with a host of amenities designed for the gentleman farmer or equestrian. The recently renovated bank barn includes 4 stalls and ample storage for farm equipment, tools, hay, feed and tack. The barn includes attached tractor stalls with automatic overhead doors and tanks for diesel fuel and gasoline. EXTRAORDINARY AMENITIES - A superb array of amenities and features are found throughout the estate. Supporting the property is a charming 1,400 SF guest house/caretaker's residence. Other ancillary structures include a separate hay storage barn. Designed for contemporary living, Cartref Farm is equipped with 21st-century amenities: Highlights include radiant floor heating and designer lighting, geothermal heating and cooling, Rinnai instant hot water heaters (2), a 1,000 gallon in-ground propane tank, emergency generator, and security and fire alarm systems. Property IS Subdividable.